After many years waiting, fans of Patrick McGoohan's film and TV work are in for a treat with the release of "Dr Syn: The Scarecrow of Romney Marsh" on Region 1 DVD on 11th November. 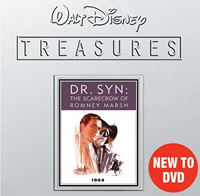 The Walt Disney release is a Treasury edition which features the 3 original episodes & the edited film version plus extra features. Click HERE to order the limited edition 2-disc tin! Extras on the disc include brief interview clips from 2008 of Patrick McGoohan himself! A review of the DVD can be found HERE. Online article on the scarecrow HERE. Thanks to James Fielding, Kevin Ryerson, Tom Mayer, and SR for this news item.